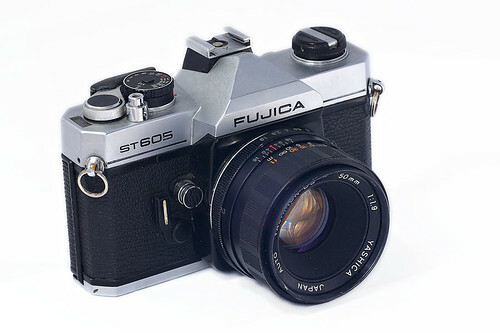 The Fujica ST605 is a 35mm SLR made in Japan by Fuji, introduced in c.1976. It has a M42 lens mount - for Praktica/Pentax Screwmount Lenses, a rubberized silk curtain focal plane shutter running from 1/2 to 1/700s. It has an internal light meter requiring two SR44 1.5 batteries. The Fujica ST605N is an updated ST605 with shutter speed setting shown in the view finder.